While others prepare for the World Cup, Romania defeated Albania 1-0 after yet another mediocre performance, in the build-up for the probably easiest ever qualifying campaign for the European Championship. 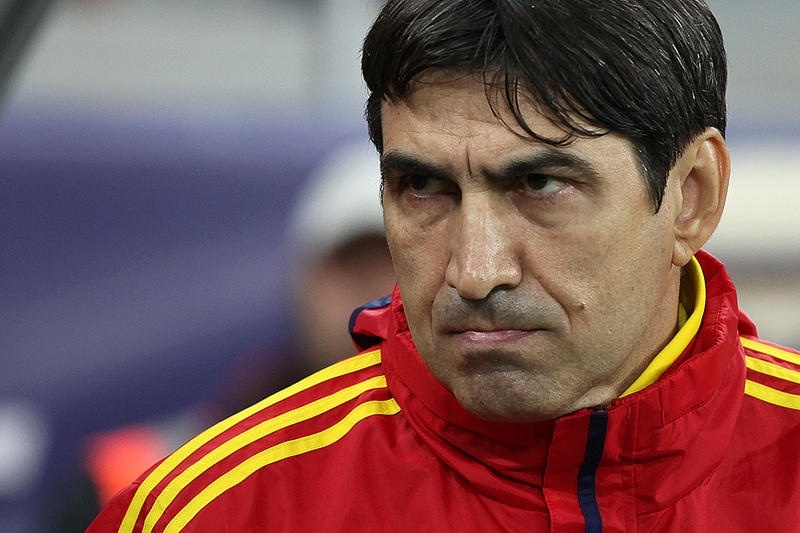 Still, Victor Piturca, the manager who still has a job only because the new head of the Romanian Federation refused to pay him 300.000 Euro, the price for an early termination of his contract, stated afterwards that Romania has the ability to defeat any team. Probably by boring it to death. Piturca will also show great proud for his incredible courage of fielding the 16 years old Cristian Manea in a friendly, meaningless match, the Viitorul defender breaking a very old record about the youngest player to feature in Romania’s senior team. The truth is, Piturca, as always, is not really keen on rebuilding this team. He sticks pretty much to the same players and he keeps on using the national team as a stage for players who really need these caps to get new contracts at club level. It’s no coincidence that 5 out of 11 starters are currently out of contract. And I also take this opportunity to present Piturca’s starting eleven vs Albania in a different key, based on club performances in the season that recently ended. And a bit of math: average age of this starting 11 is 26.3 years. Without Manea, it’s 27.4 years! Goalkeeper: Tatarusanu (27) – Champion with Steaua. Will probably sign with Fiorentina, as a free agent. Right back: Manea (16) – Youngest ever player to feature in Romania’s senior team. Avoided relegation with Viitorul in the last round of the season. Central defender: Chiriches (24) – Not so sure about his future with Tottenham, 6th in the Premier League, in spite of some bright performances. Central defender: Grigore (27) – Won a Europa League spot with Dinamo. Will move to Toulouse, on a free transfer. Left back: Rat (33) – Avoided relegation with Rayo Vallecano. Currently out of contract. Defensive midfielder: Bourceanu (29) – Contribution to Steaua’s title and Trabzonspor’s Europa League spot. 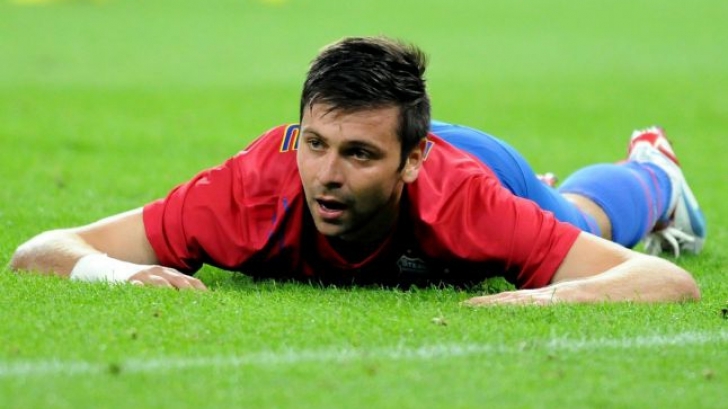 Defensive midfielder: Pintilii (29) – Champion with Steaua. Wants to leave the club. Right winger: Nicolita (29) – Average season with St. Etienne and Nantes. Currently out of contract. Supporting striker: Chipciu (25) – Champion with Steaua. Left winger: Maxim (23) – Avoided relegation with VfB Stuttgart. Striker: Marica (28) – Avoided relegation with Getafe. Currently out of contract. No worries, I also am quite sure Piturca will be able to take Romania to Euro 2016. But mostly because this one, with 24 teams at the start, will be almost impossible to miss. With the exception of Portugese right back Ivo Pinto, who impressed with Dinamo Zagreb (although I’d place the Croatian Prva HNL below our Liga 1 in terms of competitiveness), there is nobody else who made the switch easy, with good results also on the pitch, not just in their bank accounts. Ok, signing Denis Alibec was a gamble from Bologna, as the striker revived by Gheorghe Hagi and his club, Viitorul Constanta, disappointed upon his return to Serie A. He featured for just 2 minutes in the first part of the season, against mighty Juventus, but that was just a desperate use of a forward with good feet, but a mind that still looks unable to focus on football. Two other Romanian players moved to Italy last summer and both need (and unlike Alibec who is close to a transfer to Astra Giurgiu) and will have more time to adjust and prove themselves. Alexe struggles with struggling Sassuolo, featuring 6 times in the league, but just once as a starter, while Nica got a red card in his second and last appearance in Serie A for Atalanta. With Fatai unable to feature more for Club Brugge, in spite of a bright start (scored against Anderlecht in his first game), and Herea looking average in a league that, in theory, should have allowed him to impress, we can draw the line: just 2 out of 10 players stepped into their new clubs and claimed a place in the first eleven. We are two goals away from the Brazilian World Cup. And we’re playing at home, pushed by 55.000 souls. It doesn’t look that bad, really, yet there’s an overwhelming feeling that everything was lost in Athens and we’re only waiting for a painfully long confirmation, in Bucharest, on a cold Tuesday night that has so little to do with what awaits the winner in Rio, in the summer of 2014. I’ve not jumped ships, I have been pessimistic about Romania’s chances all along, but in Romanian. Now it’s time to be in English as well, so here are a few thoughts on why this now or never game has so little chances to finish with a dream result. selection and match strategy, unaware that the key absences (Tatarusanu, Chiriches, Pintilii) weaken precisely the defense he decided to put so much emphasis on once again, unable to react to the opposition’s tactics of outnumbering our central midfielders with the use of both wide forwards and opening up highways on both flanks for the advancing fullbacks, the coach was left to blame poor marking at set plays and a first goals scored from an offside position. Now, he gets a hand with his team selection, as Tatarusanu and a masked Chiriches are back, but the loss of two central midfielders (Bourceanu and Lazar) will pose new questions to his ability to select a winning 11. On the other hand, he faces again the type of game he hates and never propery prepared his team for: the one that he’s supposed to win by opening up the opposition’s defense. There’s an obvious lack of quality as far as players are concerned, I’ve said it before, we don’t really deserve to go to Brazil with this lot, but there’s the feeling that blame rests on the Piturca’s shoulders once again, both with the lot he assembles every time and with the choices he makes when it comes to picking the starting eleven. He picked Lobont in goal ahead of Pantilimon (according to his selection, the Manchester City shot stopper is Romania’s fourth option, although he recently got the nod – albeit temporarily – ahead of England’s number 1). The veteran from AS Roma, with no official games under his belt, no hunger and little authority, failed to make up for the team’s defensive errors and can only get praise for stopping Greece from netting the fourth goal. In central midfield, he paired Bourceanu with Cocis, not Lazar, losing chemistry and technical ability, mocking an entire country with his choice and shocking Cocis himself, who stated afterwards that he never expected to start this game. Upfront, behind Marica, he used Torje on the right, who was a regular starter in this campaign, but lost touch with regular football at club level, picked Stancu ahead of Maxim and, as usual, started with Tanase on the left. Picking Stancu ahead of Maxim, who’s one of the most in-form players at club level and has been a hit in the Bundesliga since he joined Stuttgart, is the main criticism Piturca faced during and after the match. I think that’s not the best approach to the matter, and not just because Stancu scored the away goal that still has a (slim) chance to make the difference. He does fit the game strategy Piturca picked for this game, he has a good fitness and form level, has not played that bad recently for the national team. Actually, Stancu deserved to start, so I would say that the best line of criticism is this: leaving Maxim out was a mistake, as he can just as well play on either flanks, where both Torje and Tanase have disappointed, both before and during the Athens encounter. 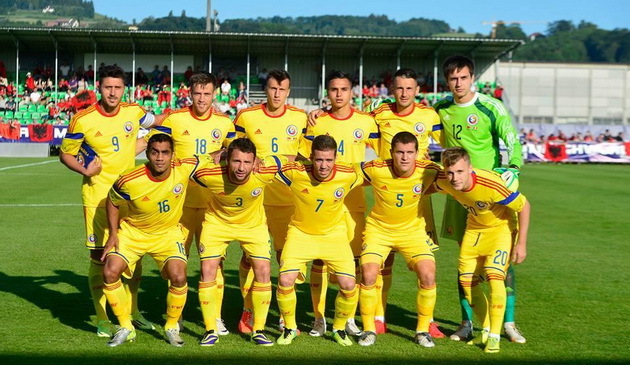 Let’s move to the second leg, where Romania is expected to start with Tatarusanu in goal, a back four of Matel, Goian, Chiriches and Rat, Cocis and Gardos in central midfield, Nicolita, Maxim and Stancu behind Marica. We get back two players that are vital for our chances to keep a clean sheet, but we are weaker than ever where often a football match is won, as the absence of Bourceanu and Lazar (both suspended) forces Piturca to do a rare thing for him: think outside of the box. The pair Cocis – Gardos is odd to say the least. Gardos has played there years ago, but he’s a central defender. Cocis has played there days ago :), but in truth he’s the type of all round midfielder that can play everywhere, but is yet to find his best role on the pitch. And he’s 30 years old… They never played together either and this pairing puts Piturca on the spot for yet another reason: why did he call up Ovidiu Hoban – who is average and out of form, let’s be honest – if he doesn’t find him up for this game? He is a defensive midfielder, the only available defensive midfielder, yet he’s not Piturca’s third choice, he’s his fifth! Romania needs Maxim’s skill and creativity to open up the Greek defense. We move further up the pitch and finally find Maxim among the expected starters, deployed behind Marica, which pushes Stancu wide to the left and pushes Tanase further left, on the bench :). The pressure will be huge for Maxim, whose trickery and cheeky backheel touches have produced nothing but disappointment so far for the national team, on the rare occasions he was give the nod. Yes, let’s be honest and say that Maxim plays better for Stuttgart than for Romania, and let’s stay honest: it happens because Stuttgart tries to play football, while Romania only tries to stop the opposition from playing football. Now, all eyes are on him and Piturca himself showed once again his terrible man management skills, by saying “Maxim will have the chance to prove me wrong in the second led”, a pathetic and useless attempt to divert the blame for not offering his most talented attacking player more than 5 minutes in Athens. Over 20 players from Liga I moved this summer to a better championship! 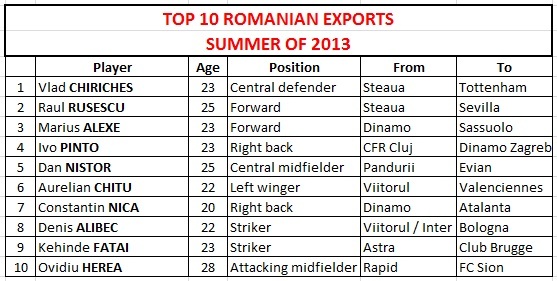 It was a summer to remember for Romanian clubs (although the newspapers haven’t noticed it just yet…)! With Chiriches finally moved to Tottenham, we have a new record transfer fee paid for a Liga I player. We also have 5 players signed by Serie A clubs, 3 gone to Ligue 1 and 1 in La Liga, none other than last season’s top scorer. Teams from Belgium, Croatia and Switzerland – good European stepping stones – have made their picks, with Russia and Turkey paying good money to either clubs or players (or both) to sign no less than 7 established footballers. And Steaua decided to keep some in-demand players to make it into the Champions League’s group stage, otherwise the numbers would have been bigger and the figures even more impressive. Below, you can find my top ten transfers of the summer, which is of course debatable, but I’ve tried to filter the twenty-something important moves using as filter the quality and potential of the player in question, age, level of the buying club and level of the league he’s going to. Do we have stronger clubs? I can only think of exceptions. Is Liga I more competitive? It surely was two-three years ago – remember the days when Steaua, Dinamo, Rapid, CFR and Vaslui were fighting to get the title from Otelul Galati -, but that race got less and less tensed, with Dinamo’s and Rapid’s financial trouble, and CFR’s and Vaslui’s loss of investment/interest. Do we sign / promote better players? I’d say mainly by accident, considering the amateur take on player recruitment and lack of funds, knowledge and dedication allocated to the youth sector (of course, I will keep Hagi’s Academy out of this!). 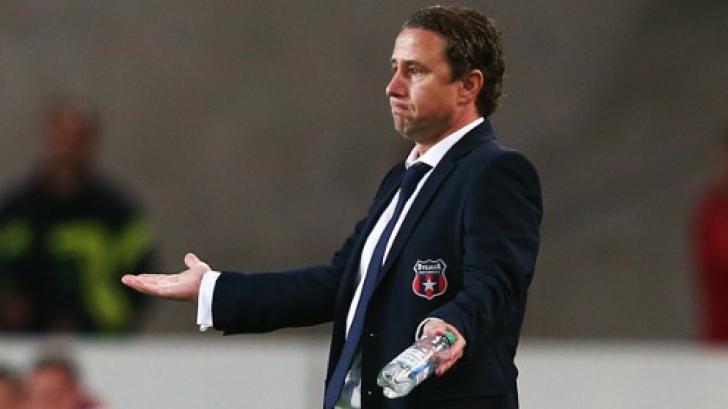 Can Steaua leave their off-the-field problems and get back to playing football? It was all perfect back in 2012! Steaua dominated the league, a reminder of the good old days, and qualified for another European spring, having the arrogance guts to take Ajax lightly and speak of the possible double with Chelsea in the Europa League. As January passed by without anything spectacular happening, other than the usual game of asking unrealistic prices for players like Chiriches, Tanase or Rusescu, things got hotter as the Amsterdam trip came into sight. 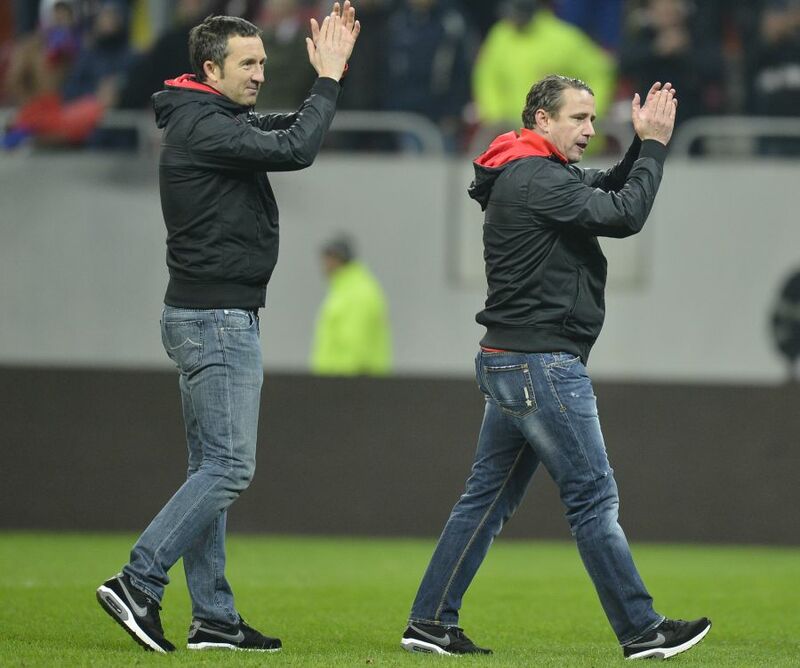 A huge betting scandal involving Laurentiu Reghecampf kept the media busy, as the young coach was placed at the heart of a possible fixed game that took place in the 1.Bundesliga, when he was playing for Energie Cottbus. It proved big enough to make the Bucharest side react “in style”, shutting down all access during the team’s second training camp. As things weren’t bad enough, Steaua’s owner scored a hat-trick of legal issues in the past few days, as his name featured in three cases and at least one of them did some damage, as Becali received a 3-year sentence with conditional suspension of execution for trying to make justice for himself by forcefully retaining the people that had tried to steal his car. All these issues seriously damaged Steaua’s image and it might have also affected the team’s morale and focus ahead of the first official match of the year. If they also diverted the attention from the on-the-pitch problems that Reghecampf had to address during this long winter break, the fans optimistic of having a strong chance to go through might have a few surprises on Thursday. Steaua has defensive problems: at right back there’s a dilemma whether to use new signing Cornel Rapa from the off or still improvise with Alex Chipciu, the quick winger that had to cover the role a few times in the past; Lukasz Szukala, who would have probably started in central defense suffered, a broken nose during a friendly game and he’s out, so the central pair will be formed by Vlad Chiriches and Florin Gardos. Both are young and, judging by the recent unconvincing performances of the highly rated Chiriches, inconsistent. Should I also mention the indifferent form of starting goalkeeper Ciprian Tatarusanu? Or move upfield and remind of the absence of Cristian Tanase – suspended – which has created little debate, but the right footed left midfielder will surely be missed.